I would venture to say that almost everyone is familiar with Microsoft windows paint - a drawing application that is very antiquated and should have been retired and replaced a long time ago. Alas, Microsoft has kept this ancient application around, and it rarely serves any purpose in today's computing world. For those users who like to do light graphics and photo work, there is a free and open-source application that works wonders in this area. I usually recommend the GIMP (GNU Image Manipulation Program) for most graphics work because it is also free and open-source. It is a great program, but it doesn't have the look and feel of the native windows environment (although it does run perfectly in windows.) There are some special hacks and versions such as GIMPShop that mimic the look and feel of the windows GUI and for those that want to go this route, I highly recommend it. For those that are unsure or uneasy about working in alternative GUIs and environments, Paint.NET is an excellent choice for a graphics editing program. As I mentioned before, it is free and open-source. 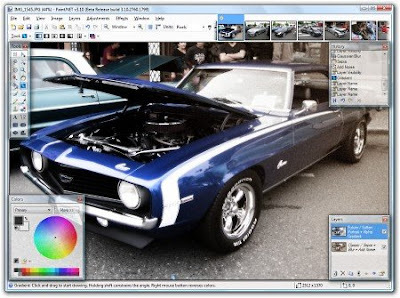 You can download it at http://www.getpaint.net/ It is very similar to Adobe Photoshop and has very similar functionality, but it is not as powerful or robust as the Adobe's professional offering. Then again, it doesn't cost anything right? For 99.9% of users out there, Paint.NET does more than necessary. Just about the only people who may need an expensive application like Photoshop are professional designers and graphics professionals. Many of them even use Paint.NET, so take that with a grain of salt. I suggest you download a copy and install it on your windows machine to see just what I mean. I'm pretty sure you will be impressed and never be forced to resort to that awful excuse for a program - windows paint.